And While You are Here, Ask Me Anything! In a new twist, artists were asked to join Robert Redford on stage during the Sundance Film Festival’s opening day press conference to discuss the impact Sundance Institute’s labs have had on their career. One of those artists was Sydney Freeland who is back in Utah with her film Deidra & Laney Rob a Train which was filmed in Heber City. We had the pleasure of working with her and supporting the project though our film incentives program so naturally it was exciting to see her film get into Sundance. We agree that Utah is a great place to film and we are focusing our efforts during the Festival to sharing our story. Today through January 26, we will be hosting a series of discussions on timely industry topics and resources we offer artists. Everything is on the table for discussion: finances, locations, casting, digital creators, equipment and more. Plus it’s a chance to connect directly with the Film Commissioner Virginia Pearce. For those who are in Park City, stop by our space at 625 Main Street to have “Coffee with the Commish” or start your own conversations with other artists or attendees in our venue. For a full schedule of events, visit our activation page: https://film.utah.gov/2017sff/. Utah Film Commission on Main will transport you to far corners of the state and conjure up nostalgic feelings for Utah’s rich cinematic history. 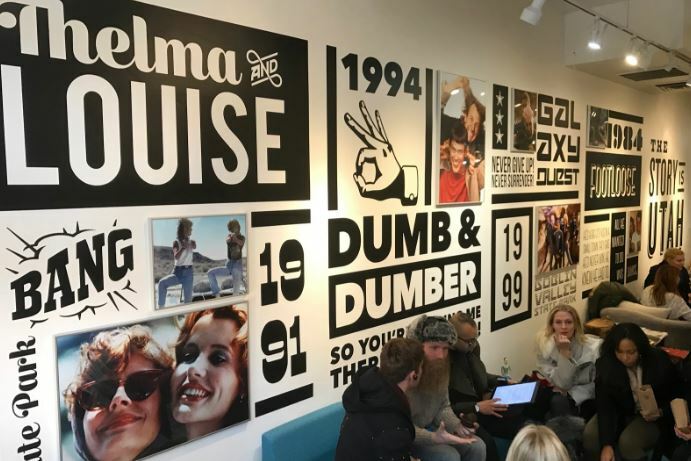 The wall graphics were designed by Shaylee Read, Creative and Design Lead for the Utah Office of Tourism who researched museum displays for inspiration. Playing off the Film Commission’s tagline “The Story is Utah” she created a meandering timeline of some of the most iconic movies filmed in the Beehive State from 1920’s Westerns to the films screening at the Sundance Film Festival today. The black ink helps the colorful film stills pop and the retro typography helps start the walk down memory lane.